Helen Lawton Smith and Loet Leydesdorff, The Triple Helix in the Context of Global Change: Dynamics and Challenges, Prometheus (in press); doi: 10.1080/08109028.2014.972135. Alexander M. Petersen, Daniele Rotolo, and Loet Leydesdorff, The Interaction of 'Supply', 'Demand', and 'Technology' in Terms of Medical Subject Headings: A Triple Helix Model of Medical Innovations (in preparation). Oivind Strand, Inga Ivanova, and Loet Leydesdorff, Decomposing the Triple-Helix Synergy into the Regional Innovation Systems of Norway: Firm Data and Patent Networks (in preparation). How Synergies in University-Industry-Government Relations Can Shape Innovation Systems, Theory Talk #68, March 11, 2015; <pdf>. Balazs Lengyel and Loet Leydesdorff, The Effects of FDI (Foreign Direct Investment) on Innovation Systems in Hungarian Regions: Where is the Synergy Generated? Regional Statistics 5(1) (2015), 3-24; doi: 10.15196/RS05101 . Leydesdorff, Loet (2015). The Triple Helix of Knowledge Production, Wealth Generation, and Normative Control: A Neo-evolutionary Model of Innovation Ecosystems. In Albert Ali Salah, Alkım Almıla Akdağ Salah, Cassidy Sugimoto, Umut Al (Eds. ), 15th International Conference of the International Society of Scientometrics and Informetrics (pp. 2-3). Istanbul: Boğazi�i University. Loet Leydesdorff & Petra Ahrweiler, In Search of a Network Theory of Innovations: Relations, Positions, and Perspectives, Journal of the American Society for Information Science and Technology 65(11) (2014) 2359-2374; <youtube presentation; St Petersburg, June 2014). Loet Leydesdorff and Inga A. Ivanova, Mutual Redundancies in Inter-human Communication Systems: Steps Towards a Calculus of Processing Meaning, Journal of the Association for Information Science and Technology 65(2) (2014) 386-399. Loet Leydesdorff and Han Woo Park, Can Synergy in Triple-Helix Relations Be Quantified? A Review of the Development of the Triple-Helix Indicator, Triple Helix: A Journal of University-Industry-Government Innovation and Entrepreneurship 1(4) (2014); open access at http://link.springer.com/article/10.1186/s40604-014-0004-z . Loet Leydesdorff and Ping ZHOU, Measuring the Knowledge-Based Economy of China in terms of Synergy among Technological, Organizational, and Geographic Attributes of Firms, Scientometrics 98(3) (2014) 1703-1719; doi: 10.1007/s11192-013-1179-1 . Mark Deakin and Loet Leydesdorff (2014), The Triple Helix Model of Smart Cities: a neo-evolutionary perspective, pp. 134-149 in: Mark Deakin (Ed. ), Smart Cities: Governing, modelling and analysing the transition. London/New York: Routledge. Inga A. Ivanova and Loet Leydesdorff, Redundancy Generation in University-Industry-Government Relations: The Triple Helix Modeled, Measured, and Simulated, Scientometrics 99(3) (2014) 927-948; doi: 10.1007/s11192-014-1241-7. Ying YE, Loet Leydesdorff, Yishan WU, 三 螺旋模型及其量化分析方法研讨 (A Discussed Study on the Triple Helix with Its Quantitative Analysis Method). China Soft Science, (2014), Issue 11; pp. 131-139. The Triple Helix, the Complexity of Technological Innovations, and the Decomposition of National Innovation Systems. An interview with Loet Leydesdorff by Ruth Knoblich. Pp. 251-258 in: Maximilian Mayer, Mariana Carpes, and Ruth Knoblich (Eds. ), The Global Politics of Science and Technology Volume I: Concepts from International Relations and Other Disciplines. Berlin: Springer, 2014. Han Woo Park, An interview with Loet Leydesdorff: the past, present, and future of the triple helix in the age of big data, Scientometrics 99(1) (2014) 199-202; http://dx.doi.org/10.1007/s11192-013-1123-4. De choreometrie van universiteit-industrie-overheidsrelaties: een dans rond de mousse-aux-trois-chocolats, in: Henk de Regt & Chunglin Kwa (Eds. ), Building Bridges - Connecting Science, Technology and Philosophy. Amsterdam: VU University Press, 2014, pp. 85-88. Triple Helix of University-Industry-Government Relations, in: Elias G. Carayannis (Ed. ), Encyclopedia of Creativity, Innovation, and Entrepreneurship, New York: Springer, 2013, pp. 1844-1851; with an additional note on N-Tuple of Helices, in: ibidem, pp. 1400-1402. Sociological and Communication-Theoretical Perspectives on the Commercialization of the Sciences, Science & Education 22(10) (2013) 2511-2527; doi: 10.1007/s11191-012-9458-4 <open access>. Loet Leydesdorff & Martin Meyer, A Reply to Etzkowitz' Comments to Leydesdorff & Martin (2010): Technology Transfer and the End of the Bayh-Dole Effect, Scientometrics 97(3) (2013), 927-934; doi: 10.1007/s11192-013-0997-5. Loet Leydesdorff & �ivind Strand, The Swedish System of Innovation: Regional Synergies in a Knowledge-Based Economy, Journal of the American Society for Information Science and Technology 64(9) 1890-1902; DOI: 10.1002/asi.22895. Wilfred Dolfsma & Loet Leydesdorff, Patentkaart van Nederland in aantal en kwaliteit, ESB 98 (4652), 25 januari 2013, pp. 42-44. Fred Y. Ye, Susan S. Yu, and Loet Leydesdorff, The Triple Helix of University-Industry-Government Relations at the Country Level, and Its Dynamic Evolution under the Pressures of Globalization, Journal of the American Society for Information Science and Technology 64(11) (2013), 2317-2325. ИНСТИТУЦИОНАЛЬНОЕ МОДЕЛИРОВАНИЕ ИННОВАЦИОННОГО РАЗВИТИЯ: ОТ ТРОЙНОЙ К N-СПИРАЛЯМ, translated by Marina Leonova; Conference "Marketing and Society," Kazan, 2013, pp. 97-99. Gaston Heimeriks and Loet Leydesdorff, Emerging Search Regimes: Measuring Co-evolutions among Research, Science, and Society, Technology Analysis and Strategic Management 24(1) (2012) 51-67. Ki-Seok Kwon, Han Woo Park, Minho So, and Loet Leydesdorff, Has Globalization Strengthened South Korea�s National Research System? National and International Dynamics of the Triple Helix of Scientific Co-authorship Relationships in South Korea, Scientometrics 90(1) (2012) 163-176; doi: 10.1007/s11192-11011-10512-11199. Robert D. Shelton and Loet Leydesdorff, Publish or Patent: Bibliometric evidence for empirical trade-offs in national funding strategies, Journal of the American Society for Information Science and Technology 63(3) (2012), 498-511. Loet Leydesdorff & �ivind Strand, Triple-Helix Relations and Potential Synergies Among Technologies, Industries, and Regions in Norway, Procedia - Social and Behavioral Sciences 52 (2012) 1-4. Wilfred Dolfsma & Loet Leydesdorff, Innovation Systems as Patent Networks: The Netherlands, India and Nanotech, Innovation-Management, Policy & Practice 13(3) (2011) 311-326. Loet Leydesdorff & Martin Meyer, 东北大学学报（社会科学版）[The Triple Helix Model and the Knowledge-Based Economy,] Journal of Northeastern University (Social Science), 12(1), 2010, 11-18. Han Park & Loet Leydesdorff, Longitudinal Trends in Networks of University-Industry-Government Relations in South Korea: The Role of Programmatic Incentives, Research Policy 39(5) 640-649; <pdf-version>. Loet Leydesdorff, Wilfred Dolfsma, & Gerben van der Panne, Measuring the knowledge base of an economy in terms of triple-helix relations, in: Ricardo Viale and Henry Etzkowitz (eds. ), The Capitalization of Knowledge. Cheltenham, UK/ Northampton, MA: Edward Elgar, pp. 291-311. Wilfred Dolfsma & Loet Leydesdorff, �Medium-tech� industries may be of greater importance to a local economy than �High-tech� firms: New methods for measuring the knowledge base of an economic system, Medical Hypotheses, 71(3) (2008) 330-334; <pdf-version>. Complexity and Technology, in: Theme section KM 1.29- Knowledge Management, Organizational Intelligence and Learning, and Complexity, L. Douglas Kiel (Ed. ), Vol. 2, pp. 42-58. Encyclopedia of Life Support Systems (EOLSS). Oxford, UK: Eolss Publishers, 2007; <pdf-version>. Wilfred Dolfsma & Loet Leydesdorff, Het Nederlandse Innovatiesysteem, ESB, 4 april 2008, pp. 214-215. �W�hrend auf hoher See ein Sturm tobt...�: Innovationssysteme, regionale Entwicklung und wissensbasierte �konomie aus der Perspektive des Triple-Helix-Modells. In: Hanno Pahl und Lars Meier (Hrsg. ), Kognitiver Kapitalismus. Marburg: Metropolis Verlag, pp. 163-193. 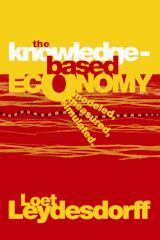 The Knowledge-Based Economy: Modeled, Measured, Simulated. Boca Raton, FL: Universal Publishers. 385 pp. ISBN 158112-937-8. Special issue: Toward an ecosystem for innovation - implications for management, policy and higher education. Introduction by Sheila Tobias, Kenneth Smith, and Loet Leydesdorff. Industry & Higher Education 20(4), 2006, 215-277. The Triple Helix and Knowledge-Based Innovation Systems. Pp. 143-152 in: Cooperation between the economic, academic and governmental spheres: Mechanisms and levers, Miroslav Rebernik et al. (Eds. ), Proceedings of the 26th Conference on Entrepreneurship and Innovation, Maribor, Slovenia, March 30-31, 2006. Han Woo Park, Loet Leydesdorff, Heung Deug Hong, & Sung Jo Hung, Indicators for the Knowledge-based Economy: A Comparison between South Korea and The Netherlands. Scientometrics 65(1), 2005, 3-27; <pdf-version>. Wilfred Dolfsma, Loet Leydesdorff, & Gerben van der Panne, De kenniseconomie de maat genomen, ESB, 90, nr. 4469, 26 augustus 2005, pp. 366-8. [Discussie met naschrift, ESB, 90, nr. 4472, 7 oktober 2005, p. 447]. Han Woo Park, Loet Leydesdorff, Heung Deug Hong, and Sung Jo Hong, , [Triple-Helix Indicators for the knowledge-based innovation system: A comparison between South Korea and The Netherlands], Journal of the Korean Data Analysis Society 6(5), October 2004, pp. 1389-1402 <pdf-version Acrobat 6>. A methodological perspective on the evaluation of the promotion of university-industry-government relations, Small Business Economics 20(2) (2003) 201-204. Loet Leydesdorff and Henry Etzkowitz, Can �The Public� Be Considered as a Fourth Helix in University-Industry-Government Relations? Report of the Fourth Triple Helix Conference, Science & Public Policy 30(1) (2003) 55-61. Loet Leydesdorff and Martin Meyer, The Triple Helix of University-Industry-Government Relations: Introduction to the Topical Issue, Scientometrics 58(2), 191-203. 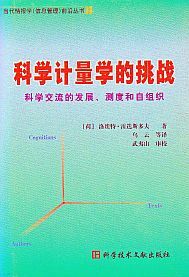 The mutual information as an indicator of complexity and self-organization in relational systems, In: J. Guohua, R. Rousseau, W. Yishan (Eds. ), Proceedings of the 9th International Conference on Scientometrics and Informetrics. Dalian: Dalian University of Technology Press, pp. 161-171. The Complex Dynamics of Technological Innovation: A Comparison of Models Using Cellular Automata , Systems Research and Behavioural Science 19(6) (2002) 563-575. Loet Leydesdorff, Philip Cooke, and Mikel Olazaran, �Technology Transfer in European Regions: Introduction to the Special Issue,� Journal of TechnologyTransfer27(1) (2002) 5-13. (with Philip Cooke and Mikel Olazaran, Eds. ), Special issue: Regional Innovation Systems in Europe, Journal of Technology Transfer 27(1) (2002) 5-145. Complexity and Technology, in: Theme section KM 1.29- Knowledge Management, Organizational Intelligence and Learning, and Complexity, Encyclopedia of Life Support Systems (EOLSS). Oxford, UK: Eolss Publishers, 2002; at <http://www.eolss.net>. Byzonytalans�g �s az "id�" kommunik�ci�ja, Inform�ci�s T�rsadalom (The Hungarian Information Society) 11(2), (2002) 40-59. Loet Leydesdorff and Zeng Guoping, University-Industry-Government Relations in China: An emergent national system of innovations, Industry and Higher Education 15(3) (2001) 179-182. Marta Riba & Loet Leydesdorff, Why Catalonia cannot be considered as a Regional Innovation System, Scientometrics 50 (2) (2001) 215-240. Henry Etzkowitz and Loet Leydesdorff, Innovation Inspired: The Triple Helix of University-Industry-Government Relations, Technology Access Report 14 (10) (2001) 4-6. Loet Leydesdorff and Henry Etzkowitz, A Triple Helix of University-Industry-Government Relations: Mode 2 and the Globalization of National Systems of Innovation, in: Science under Pressure (Aarhus: The Danish Institute for Studies in Research and Research Policy, 2001/1). �El nuevo r�gimen de comunicaci�n en las relaciones Universidad-Empresa-Gobierno: una triple h�lice de innovaciones,� Ekonomiaz 45 (3) (2001) 60-77. A Triple Helix of University-Industry-Government Relations, Scipolicy-The Journal of Science & Health Policy, Vol. 1, No. 1 (2000), 51-60. The Triple Helix: An evolutionary model of innovations Research Policy 29(2) (2000) 243-255. Henry Etzkowitz & Loet Leydesdorff, "The Dynamics of Innovation: From National Systems and "Mode 2" to a Triple Helix of University-Industry-Government Relations," Introduction to the special "Triple Helix" issue of Research Policy 29(2) (2000) 109-123. Loet Leydesdorff & Michael Curran, Mapping University-Industry-Government Relations on the Internet: the Construction of Indicators for a Knowledge-based Economy, Cybermetrics 4 (2000), Issue 1, Paper 2 at <http://cybermetrics.cindoc.csic.es/articles/v4i1p2.html>. Yuko Fujigaki & Loet Leydesdorff, "Quality Control and Validation Boundaries in a Triple Helix of University-Industry-Government Relations: �Mode 2� and the Future of University Research," Social Science Information 39(4) (2000) 635-655. Loet Leydesdorff and Peter Van den Besselaar, Technological Development and Factor Substitution in a Complex and Dynamic System, Journal of Social and Evolutionary Systems 21(2) ( 2000) 173-192. Henry Etzkowitz & Loet Leydesdorff (Editors), Daxue yu Quanqiu Zhishi Jingji [Universities and the Global Knowledge Economy], Bejing, 1999. Loet Leydesdorff & Henry Etzkowitz, Triple Helix of innovation: introduction, Science and Public Policy 25 no. 6 (1998) 358-64. [Introduction to the theme issue, Etzkowitz & Leydesdorff (eds. ), pp. 358-415]. Loet Leydesdorff & Henry Etzkowitz, The Triple Helix as a model for innovation studies, Science and Public Policy 25 (1998, nr. 3), 195-203. Henry Etzkowitz & Loet Leydesdorff (Eds. ), A Triple Helix of University- Industry-Government Relations, Industry & Higher Education 12 (1998, nr. 4) 197-258 (with an Introduction on pp. 197-201). Loet Leydesdorff and Henry Etzkowitz, Technology Innovation in a Triple Helix of University-Industry-Government Relations, Asia Pacific Tech Monitor 15 (1998) 32-38. (with Henry Etzkowitz, eds. ), Universities and the Global Knowledge Economy: A Triple Helix of University-Industry-Government Relations (London: Cassell, 1997), 174 + viii pp. Henry Etzkowitz & Loet Leydesdorff, Introduction: Universities in the Global Knowledge Economy, in: ibid., 1-8. The New Communication Regime of University-Industry-Government Relations, in: ibidem., pp. 106-117. Loet Leydesdorff & Henry Etzkowitz, A Triple Helix of University-Industry-Government Relations, in: ibid., pp. 155-62. Henry Etzkowith & Loet Leydesdorff, "Policy Dimensions of the Triple Helix of University-Industry-Government Relations," Introduction to: Henry Etzkowitz & Loet Leydesdorff (Eds. ), Special Issue on Science Policy Dimensions of the Triple Helix of University-Industry-Government Relations, Science & Public Policy 24 (1) (1997) 2-52. Loet Leydesdorff & Henry Etzkowitz, Emergence of a Triple Helix of University-Industry-Government Relations, Science and Public Policy 23 (1996) 279-86. Henry Etkzowitz & Loet Leydesdorff, A Triple Helix of Academic-Industry-Government Relations: Development models beyond "Capitalism versus Socialism", Current Science 70 (1996) 690-3. The Trans-Episteme of University-Industry-Government Relations, in: Ruhi Kaykayoglu and Okyay Kaynak (eds. ), Proceedings of the International Conference of Technology Management: University/Industry/Government Collaboration, June 24-26, Istanbul: Bogazici University, pp. 194-9. Loet Leydesdorff & Henry Etkzowitz, Report on the Conference in Amsterdam, 3-6 January 1996: A Triple Helix of University-Industry-Government Relations, in: Ruhi Kaykayoglu and Okyay Kaynak (eds. ), Proceedings of the International Conference of Technology Management: University/Industry/Government Collaboration, June 24-26, Istanbul: Bogazici University, pp. 200-5. Henry Etzkowitz & Loet Leydesdorff, The Triple Helix---University-Industry-Government Relations: A Laboratory for Knowledge Based Economic Development, EASST Review 14 (1995, nr. 1) 14-9. Henry Etzkowitz & Loet Leydesdorff (Eds. ), Universities and the Global Knowledge Economy: A Triple Helix of University-Industry-Government Relations. Book of Abstracts. Amsterdam: University of Amsterdam. 169 pp. (with Peter Van den Besselaar, eds. ), Evolutionary Economics and Chaos Theory: New Directions in Technology Studies. London: Pinter, 1994. New Models of Technological Change: New Theories for Technology Studies (Epilogue), in: ibid., pp. 180-192. Gertrud Blauwhof and Loet Leydesdorff, New Developments in Technology Studies: Evolutionary Economics and Chaos Theory, Rapportage over de gelijknamige workshop aan het Ministerie van Economische Zaken (juni 1993). (ed. ), New Developments in Technology Studies: Evolutionary Economics and Chaos Theory, Book of Abstracts, Amsterdam: Department of Science and Technology Dynamics, 1993. "Self-Organization" as a Theme for Technology Studies, EASST Newsletter 11 (1992, nr. 1) 10-13.